Last year we had our garden in the ground. By the middle of the summer, the weeds took over and the dirt turned into swamp land. At one point while I was weeding, I lost my shoe. It was horrible. This year I told Matt that we were moving the garden area to the other end of the yard and we were going to build boxes. My neighbor friend and I got serious with this gardening stuff and even took a Square Foot Gardening class through Community Ed. We both learned a lot and decided that that was the way we wanted to set up our garden areas. Matt and I came up with a layout for our garden area. We decided on (4) 4'x 4'x 12" (2) 4' x 11' x 12" and (1) 4' x 10' x 12" boxes. We went to Home Depot to buy our supplies. First, Matt cut the boards to the sizes we needed. Next, I spent hours painting the front, sides and ends of each board. 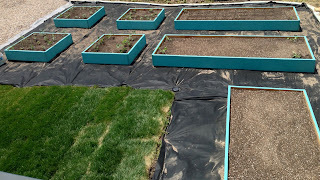 I chose to paint my garden boxes Behr's Teal Zeal. In the gardening class, I learned that if you are going to use wood as your building material for the garden boxes, you need to seal the wood that the dirt is going to touch. The best thing to use that is natural and doesn't have chemicals in it is LinSeed Oil. So, after the paint was dry, we turned the boards over and and rubbed the oil on with a paper towel. Once the oil is applied you have to let the boards sit for about 24 hrs. Just a side note, LinSeed Oil smells yucky. You need to wear gloves if you dont want your hands saturated with this stuff. Next, attach the boards together using deck screws. 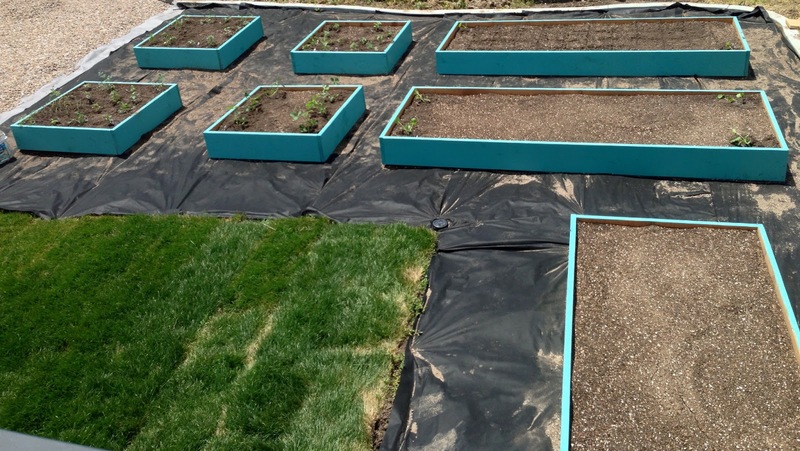 Before we put the boxes outside, in our prepared garden spot, we laid down weed barrier fabric. I hate weeds, so this stuff is a must in my yard. 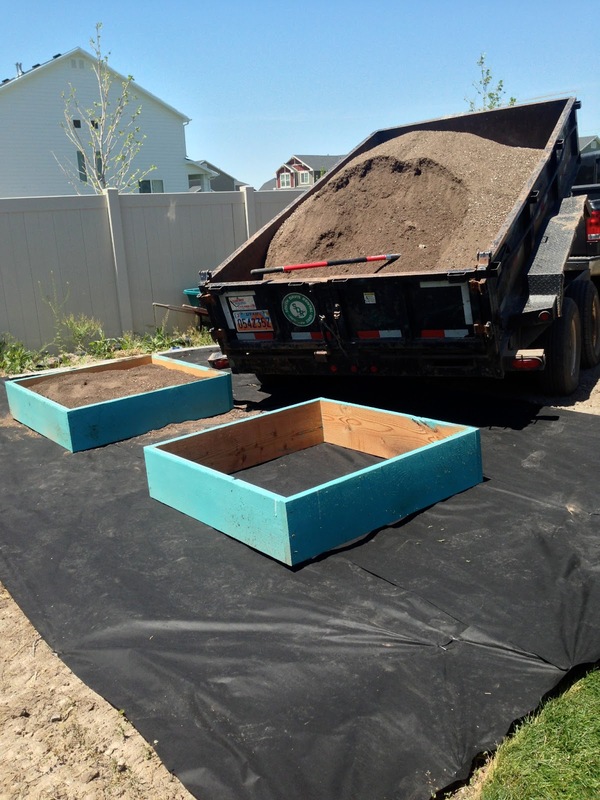 We rented a dump trailer at South Davis Rental and went to Evergreen Soils in Layton, Ut to get our garden soil mix. We ended up getting six yards of dirt to fill the boxes. We spent around $200. Not bad. A few days later, I planted my crops. I planted tomatoes, peppers, pumpkins, corn, ghords, herbs, and cucumbers. Two months ago, this is what our backyard looked like... covered in weeds. Matt had to weed eat this whole backyard many times. I Love that idea! Your back yard looks wonderful. You and your hubby are so resourceful. What is the paint color you used for the boxes? I love it!